i totally relate to this ^^ the fourth panel made me giggle. pwned by the GLARE! YES! first panel makes spoon’s hand look like cane… you know those canes that are used to take bad actors out of the scene? I actually think that Spoon was using one!!! Particularly when they were funny, when they used to make great paper and cardboard jokes. It’s just not about the cardboard any more. At least there’s more character development now! Their personalities are really beginning to unfold! Eh? Eh? Sorry. Haha! Do NOT mess with the polar bear. LOL, im just like polar bear.. I glare at people. Reminds me off when me and my friend had this month of silence. JUSTICE HAS BEE SERVED! whoop whoop. GUILTY!! I love the spoon!! ha ha, spoon got pwned. 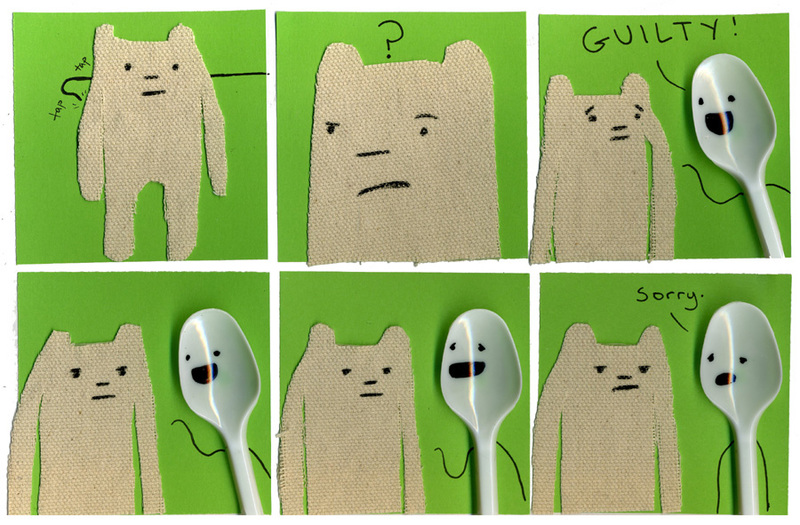 Polar Bear pwned Spoon. ; v ; My hero!